On arrival in the little town of Petrinja, you are welcomed by the all-enveloping scent of the ancient lime trees, although the June air is none too warm. The atmosphere, however, is warm and friendly, and made festive by the presence of so many youth choirs, so many young voices, vivid and dynamic. The “Sounds of June” International Choral Competition is taking place here in Petrinja, Croatia, for the third year. 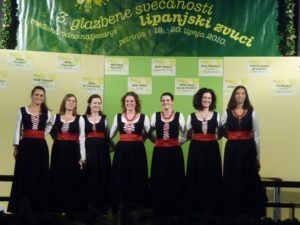 Choirs from Zagreb and from a number of other towns in Croatia and neighbouring Slovenia have followed one another on the stage in the two classes of the competition: Classical Choral Music and Choral Folk Music. The rich variety of the music performed reflects the richly varying landscapes of this country shaped like a boomerang, stretching from the slopes of the Julian Alps in the west to the plain of the ancient region of Pannonia in the north-east. 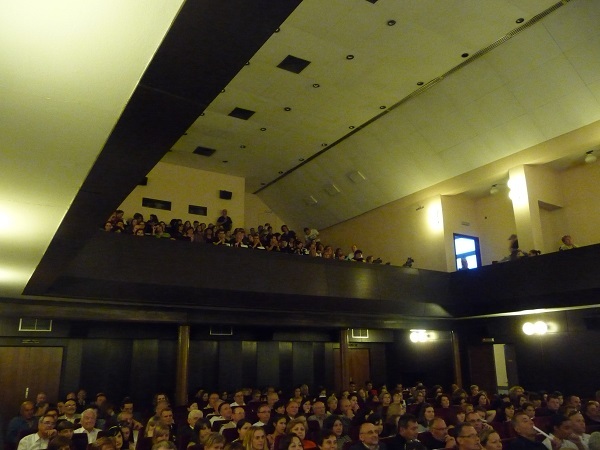 An attentive and participatory audience welcomed the winners selected by the Jury comprising Branko Stark (Croatia), President, Andrea Angelini (Italy), and Bojan Pogrmilović (Croatia). The Grand Prix was awarded to the ‘Dišpet’ ensemble from Zagreb, directed by Jurica Bošković. 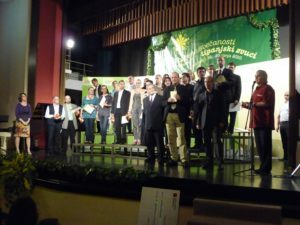 The same choir, performing the traditional piece ‘Procvala grana ljiljana’ harmonised by Joško Ćaleta, also won the prize awarded by the Association of Croatian Composers for the best performance of a piece written by a Croatian composer. Out of doors the temperature dropped considerably with the unexpected arrival of a heavy summer mist but inside the Auditorium the busy to-ing and fro-ing of people preparing for their performance on stage or going to join the various groups gathering spontaneously in surrounding rooms, kept the atmosphere warm and welcoming. Well-deserved applause went to Snežana Ponoš (Croatia) and Marjetka Podgoršek Horžen (Slovenia), recognised as the best directors. Music traverses time, evolving, experimenting, linking closely with a place, touching the emotions, telling of people and events, dreaming. Composers, like historians, may narrate their own times or range further afield. The first prize in the Choral Composition festival was won by Bruno Vlahek (Croatia) for his setting of ‘Laudate Dominum’. And speaking of writing – writing music, but not only music – we owe to Slavoljub Penkala of Zagreb the invention of a little gadget destined to revolutionise writing: the fountain pen. The brilliant inventor opened the first factory for producing fountain pens in 1911, and immediately met with huge success, so much so that the name Penkala became a synonym for the pens he produced. 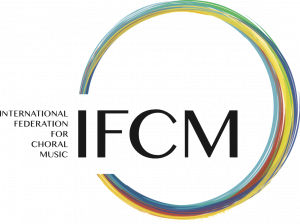 If it is true that environment forges character, apart from one’s personal inclinations, it is equally true of music: many-faceted and widely differing musical experiences nevertheless have a common denominator, intrinsic to the formation of character. Character may be formed gradually, or it may be a sudden whirlwind, like a gust of the cold, dry ‘bora’ which in this part of the world has been known to reach 100 km an hour. The ‘bora’ has its positive side, too, since it clears the air and also the surface waters of the sea, making them clear and transparent. And last but not least, the local cuisine also deserves a mention. Croatia is a composite country, which makes for great variety even within a relatively small region: from harsh stony Istria to Slavonia and Barania, where crops abound, to the coast and the riches offered by the sea. In short, there is something for everyone!